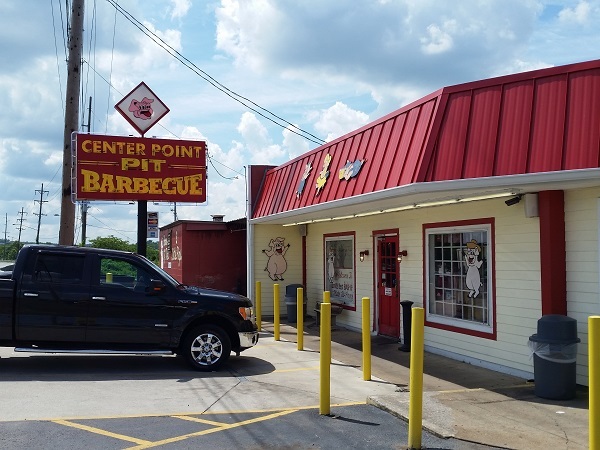 Center Point Pit Barbecue, Hendersonville TN – Marie, Let's Eat! After lunching in Chattanooga, my daughter and I continued up I-24 listening to her Eighties Alternative station on Pandora, prompting her to note, after the station played “Blue Monday” and “How Soon is Now” back to back, that songs were really long in the 1980s. Our next stop was in Antioch, where we picked up our friends Brooke and Matt. Regular readers might recall that the last time we were in the Nashville area, it was to attend their wedding. They helped schedule an afternoon of shopping and finding a few vintage and thrift places for my girlchild to look at clothes. Appropriately, considering how she’s been enjoying New Order and The Smiths, she picked up a very, very 1980s sweater. But first, we motored up to Hendersonville, about half an hour’s drive from Antioch up I-65, for barbecue. I’d picked Center Point based on the story at the sadly defunct 3rd Degree Berns blog (linked below), which surprised our server. “I don’t know that one,” she said. “Most people know us from Guy Fieri’s show.” I actually didn’t realize that Center Point had been spotlighted on Triple-D, but Fieri’s team of researchers and producers are darn near flawless in finding good places to eat, and this was an excellent stop. 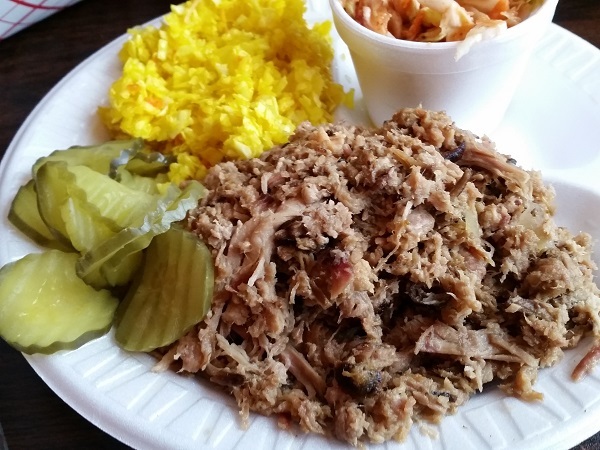 Center Point proved to be one of my favorite barbecue meals in middle Tennessee. Center Point opened in 1965 and does its smoking over hickory in an adjacent building. Business has boomed so much – the hundred-plus autographed glossies of country music stars is impressive, even for Nashville – that the owners have had to augment the original fire pit with a pair of Ole Hickory brand steel smokers. They do the expected pork, chicken, and ribs, along with some concessions to today’s market for silly combinations. They also offer burritos and loaded potatoes and loaded fries with barbecue sauce and sour cream and, in what may be a first in my experience, barbecue pita pockets dressed with the spicy red slaw. The pork is available either pulled or what they call minced and what I’d call chopped. It’s very good, smoky and a little moist, really reminiscent of the flavor of the pork at Blind Pig BBQ in Jackson GA. 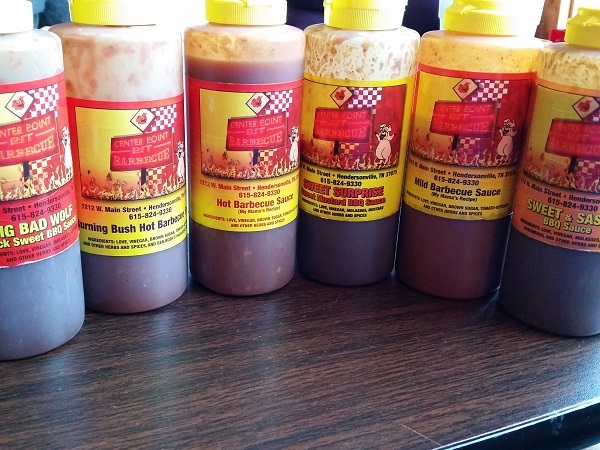 The restaurant offers six different sauces, and they’re all variants of what I’d expect from the middle Tennessee / Alabama / Georgia region. That is, they’re all tomato-based with varying levels of vinegar and peppers. The Sweet Surprise sauce emphasizes mustard on the label, but it’s not at all a yellow, gold, or orange sauce like you’d find in midlands South Carolina or middle Georgia. The differences between each are really quite subtle, and even the hottest ones don’t stand out as especially brutal. Everybody was very impressed with the sides, and our server, evidently keen to win over newcomers, made sure that we got lots of extras to sample. I asked for the vinegar slaw and the spicy red slaw, and she offered to bring me some barbecue beans as well. Potato salad, green beans, and mashed potatoes were also very popular, although I think that we missed out, not ordering the fried green tomatoes. Those get lots of praise from other writers. Posted on July 6, 2015 August 22, 2017 by Grant G.Posted in barbecue, nashville, tennessee, triple-dTagged barbecue, diners drive-ins and dives, nashville, tennessee.